The Bill and Melinda Gates Hall at Cornell University has a commanding figure in the rather quiet parts of the Cornell Campus in Ithaca, New York. Morphosis Architects were commissioned to design this somewhat dramatic building with an intention by the owners to spack some life into the landscape of a dull environment. What stands there is an epic achievement of drama, something that rejuvenates the 149-year-old Cornell Campus to the architectural landscape it used to boast before the postwar modernist period in the 20th century. For decades, the Computer Science students were stuffed into engineering buildings that were not able to accommodate their huge numbers. The Information Science students on the other hand were left in rented spaces at the extremes of the campus. This Bill and Melinda Gates Hall was built to accommodate for these two faculties who technically, did not have a place to call home for ages. The 9,290 square meter building houses faculty offices, a 151-seat lecture hall and top-notch teaching and research labs for the computer and information science departments. Morphosis architects led by the founder Thom Mayne wanted this building to have as many communal spaces as possible to enhance interactions, and encourage transparency and collaboration between the occupants. 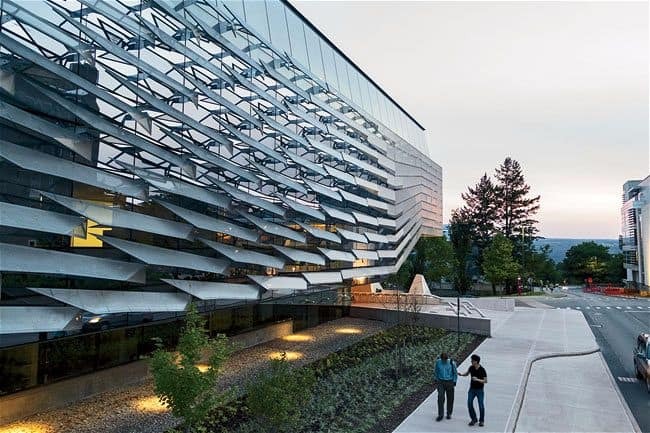 A glass façade encloses the facility with customized exterior perforated stainless steel panels acting like sun-shading elements to the North, South and West facades. These panels also enhance the rugged-like character of the façades and are attached to the glass using steel tabs. The main entrance is located on a slightly elevated plaza and opens into a skylight atrium that is 5 meters high. Orange fritted glass define the atrium on the north and east sides. A rectangular block accommodating teaching and research labs hides behind the glazed atrium and stairwell. The rectangular volume was planned following a simple U shape with double-loaded corridors. The architects played with spatial arrangement to angle various walls along hallways in order to inject some dynamism into what would otherwise have been an uninspired grid. The rectangular block accommodates labs, offices, conference and seminar rooms, informal lounges and open collaboration spaces. On the West façade, Morphosis took off the first two floors of the building to create a very deep partially cantilevered overhang under which the plaza leading to the main entrance is situated. The underside part of this overhanging cantilever was clad in orange metal to produce a vibrancy like that of the sun, the effect of which might help fight depression in the winter when it’s dark, grey and very cold. The top floors including the cantilevered section all depend on the support of two reinforced concrete steel columns with a group of splinters lying at the base of the columns. The splinters have no ideal function apart from representing the rocky nature of the narrow valley which is in between the hilly terrain of the area. The lecture hall is located on a lower level and clad in white pleated walls of perforated wood. The cantilevered end of the third floor houses a student lounge which has been fitted with a glass floor at the protrusion in order to direct natural light into the space. The Bill and Melinda Gates Foundation funded part of the $60 million used to put up this facility that is now awaiting LEED Gold certification from the U.S Green Building Council. For the 500 undergraduate students and 350 graduates who meet here every day to study, interact and research this is a building that was worth the wait. Past students will be sorry that they missed the opportunity to use this facility but for the current and future majors, this is a dream come true at the right time. Ian Mutuli is the Founder and Managing Editor of Archute. He occasionally writes about startups and tech for The Press Farm. He is also a graduate architect from The University of Nairobi, Kenya. Visit Archute's profile on Pinterest. Stay updated on everything architecture. Signup today for the Archute Newsletter. Studio FH’s Gahinga Batwa Village Giving Hope To a Marginalized Group in Uganda. Copyright © 2018 Archute | All rights reserved.